Next Friday is Take Your Dog to Work Day — and a perfect opportunity to show Fido what you do all day when you leave him at home. But the difference between a fun Friday versus a miserable one is a little thought and preparation. Is Fido ready for work? Not every dog can hang out peacefully in an office all day. Shy, aggressive or high energy dogs aren’t good candidates for this experience. Well-behaved and trained dogs will usually take the novelty in stride and be true canine ambassadors. How will this affect your boss, co-workers, clients or customers? Some people don’t like or are afraid of dogs. Others are allergic to animals. It’s a bad idea to force them to spend a working day around a dog. 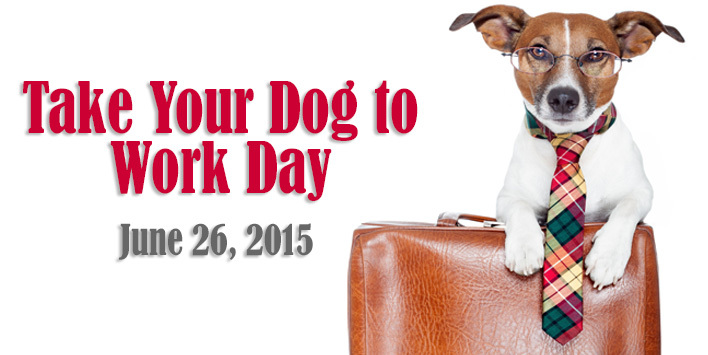 It can cause conflict and ill-will that won’t disappear when Take Your Dog to Work Day is over. What is your schedule like? If you’ll be in the office all day to watch your dog, great! But what if you get called into an hours-long meeting? Or out to make a presentation to a client? Who keeps an eye on the dog and tales him out for a walk? It’s not fair to ask a co-worker to be responsible for your dog. How dog-friendly is your working area? Tucking a lap dog into a desk drawer with a pillow is one thing, working around a Bernese mountain dog is something else. Can Fido get into poisonous plants (like dracaenas, dumb canes or dieffenbachias) or toxic office supplies (like correction fluid and permanent markers)? Will she chew on electrical cords? Is your “go bag” packed? Taking your dog to work is a like taking a mini-trip. You need to be prepared. Having a neat bag with a water bowl, poop bags, clean-up supplies for accidents and treats will help make this visit a pleasure for all. Treats are real ice breakers for a dog meeting new people. Having healthy treats helps to keep well-meaning but poorly informed people from feeding your dog candy, cookies, chips or lunchtime burritos that might upset your dog’s stomach. You may want to bring a folding crate or a baby gate to keep your dog from wandering while you work. Take Your Dog to Work Day was launched in 1999 by Pet Sitters International to show what great companions dogs make and promote dog adoptions. It’s held every year on the Friday after Father’s Day. It’s not known how many businesses actually participate because they aren’t required to register. For a number of companies, having dogs in the office is a daily routine. It’s a perk for employees that helps reduce stress and increase communication. It’s a no-brainer at a company like Mars, a Virginia-based candy and pet food maker. But companies like Google and Kimpton a San Francisco-based hotel and restaurant group, have an open door policy for dogs. Some companies like VMware, a cloud and virtualization software company in Palo Alto, require employees to sign an agreement on dog etiquette and give each dog a special tag and bandana. SalesForce, a San Francisco cloud computing company, has a special room where up to six employees cn reserve desks and bring in their dogs. Other companies have a more laid back approach. In smaller, owner-run businesses, it’s much easier: what the boss says goes.